Bristol, a settlement of only a thousand years standing, and therefore a recent urban development relative to many of its European contemporaries, provides the setting and venue for what follows. At the beginning of this period Bristol was a small, recently established settlement on the margin, the wild west, of Anglo-Saxon England. Its locational advantages were immediately apparent to the Normans, who defended themselves and asserted their authority by building both castle and abbey. The period between 1066 and 1085, when the Domesday survey was undertaken, saw an unusually rapid expansion of economic activity in the area. Three hundred years later, in 1373, Bristol received a royal charter from Edward III which recognised the boundaries of the new city and its relative importance in his kingdom. Bristol slowly but surely, and over the very long run, was to expanded both its territory and its sphere of influence. 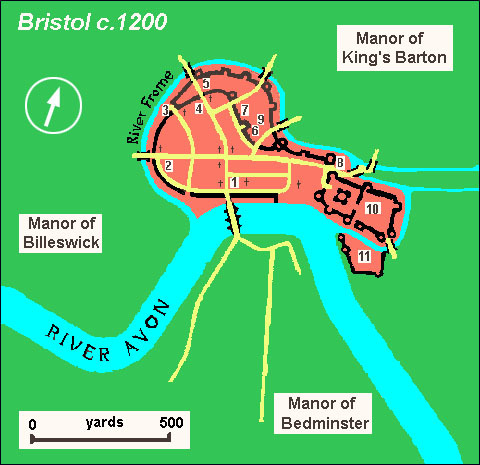 This continued until the last decade of the millennium when local government reorganisation reversed this process for the first time in the Bristol history, the boundaries imposed for reasons of political expedience constrained its direct influence to the core of what has become the city's region. English City: the growth and future of Bristol . Published with kind permission of Cadbury, Ltd.
Bristol's medieval merchants developed coastal trade with other ports in the British Isles and shipped to France, where Normandy and Bordeaux were particularly important. Although shipping would become a relatively less important component of the city's economy in the nineteenth century, the port has remained a significant element until the present day. If trade created a significant portion of Bristol's prosperity, in 1348 it was probably the carrier of Bristol's greatest disaster, the Black Death. Bubonic plague entered England from its south west coast, probably at Weymouth in April; within a month of its arrival many citizens of Bristol could be counted amongst its earliest British victims. The population was at least decimated and perhaps as many as one in three persons died in an episode which traumatized all of European society. The deaths of hundreds of thousands of people disrupted severely the economic, social, political and religious relationships which underpinned the world of those who survived. In the city's region recovery from this demographic disaster came but slowly and the revival of urban life was an important facet of this renaissance. For much of the next four hundred years, until industrialisation restructured England's economic geography, Bristol was England's second most important city, its population exceeded only by London. Trade expanded with western Europe and commercial contacts eventually encompassed north America, Africa and the Caribbean; human cargoes, in the form of African slaves, constituted an important component of the city's triangular trade across the North Atlantic. During this period Bristol was important as an industrial and commercial centre, ceramics and metal goods were exchanged through trade for sugar and other tropical products which, in turn, were exported as processed commodities. It has been proposed that Bristolians were slow to see the economic opportunities offered after 1750 by industrial growth based on coal and iron; this is surely wrong. It is often suggested that the 'Industrial Revolution' was born in Coalbrookedale, on the River Severn in Shropshire, fathered by Abraham Darby. Darby was a freeman of the city of Bristol and its business community provided many of his customers and much of his capital. Bristol, if not the cradle of the 'Industrial Revolution', provided the hand which rocked the crib. However, for many reasons, the term 'Industrial Revolution' is not helpful as a description of English economic growth: it suggests rapid economic growth, the primacy of industry and a major structural change in the economy in favour of manufacturing activities. None of these apply to the English economy. The problematic nature of the term is even more obvious when Bristol is considered. By 1750, when the city is often regarded as being at its zenith, Bristol's development had been based on long term, sustained, unspectacular and broadly based economic growth which incorporated both the industry and services sectors. Between 1750 and 2000 Bristol experienced long term, sustained, unspectacular and broadly based economic growth which incorporated both the industry and services sectors. 1750 did not see a major break in trend and neither did any other year, decade or epoch. What is remarkable about Bristol's economic growth is the opposite of an 'Industrial Revolution', it is the continuity of change. How did Bristol fare during this period? For the most part, Bristol's population was relatively well fed, many of its inhabitants enjoyed relatively high living standards and its bourgeoisie were relatively prosperous. Alongside this, many of Bristol's inhabitants experienced poverty, and for some this poverty was acute. This was far from unique to Bristol; it was true of all major urban centres in England. It is also not significant that some of Bristol enterprises failed, languishing and dying in the face of economic difficulty. In a capitalist economy they always do and must; it is failure which provides the dynamic, the creative destruction, which drives innovation, initiative and risk. This is the counterpart of the carrot that urges the creation of new firms. Bristol exhibited neither excess company mortality nor a deficit in the births of firms. Structural change, through the development of new economic activities in both sectors, industrial and services, prompted further development across a wide range of activities. It is of little significance that after 1800 the magnitude of Bristol's population was eclipsed by the new urban centres based on textile production in the north of England. In this context, size does not matter. Throughout the last six hundred years Bristol has remained a major British urban centre and, as such, it is worthy of historical attention. And yet Liverpool, Manchester, Leeds and Bradford have received the lion's share of the historian's attention. Until very recently even London, which Bristol resembles in many ways, has been overshadowed in the monographs and textbooks which describe and analyse the nineteenth century British economy by these latecomers to the English urban landscape. In relative terms, Bristol has received little attention from the historians. This is not to gainsay the contribution of those who have researched the history of the city. Nor is it to sell short the efforts of the local Branch of the Historical Association, which has produced over one hundred pamphlets that record aspects of the city's past. Indeed, fulsome evidence of this scholarly effort is reported and made more easily accessible in the New Bristol Bibliography presented on this CD. However, the startling fact remains that this bibliographic ensemble would be dwarfed by a comparable publication which took as its focus any of England's more recently developed major urban centres. One could dwell on analysis of this phenomena, no doubt stressing the 'shock of the new' and lamenting the neglect of continuity in English historiography, but it is perhaps more fruitful to point out simply that, as the subject of historical enquiry, Bristol deserves more attention than it has received. The case for more research on Bristol can also be made from a different perspective. Bristol, like the country as a whole, did not experience a major watershed, a sudden break in the economic growth trajectory or anything which might be reasonably defined as an 'Industrial Revolution'. Its history is dominated by change which has been persistent but undramatic, continuous but comprehensive, the result of the actions of individuals but all-embracing. In this sense, Bristol might be considered one of the more representative microcosms which a historian could select to illustrate the economic, social and political history of England over the most recent millennium.